CSBC, Bihar has cancelled the recruitment for Bihar Constable and Fireman which was advertised in May this year. Central Selection Board of Constable or CSBC of Bihar Police, the official recruitment agency of the state police force, has cancelled the recruitment for Bihar Constable and Fireman which was advertised in May this year. The CSBC recruitment was notified for total 11,865 posts, out of which 9900 were for Constable post in Bihar police and 1965 posts were for Fireman post in Bihar Fire Services. CSBC Bihar has now published a notice on the official website on November 9, 2018 notifying that the advertisement 02/2018 dated May 25, 2018 or the Constable and Fireman recruitment has been cancelled. The written examination for the Constable and Firemen post was scheduled on November 25 and December 2. CSBC, Bihar had also released the admit cards for the upcoming written exam. The written exam also stands cancelled. The Board will release further notification for candidates who had applied for these vacancies later. The Board has not given any reason or clarification for the cancellation of the constable recruitment. The cancellation of the recruitment will be a major disappointment for candidates since a high number of vacancies were at stake. Candidates are advised to keep visiting the official website for any further updates. The official updates regarding CSBC police recruitment will be available on the official website of the Selection Board, csbc.bih.nic.in. 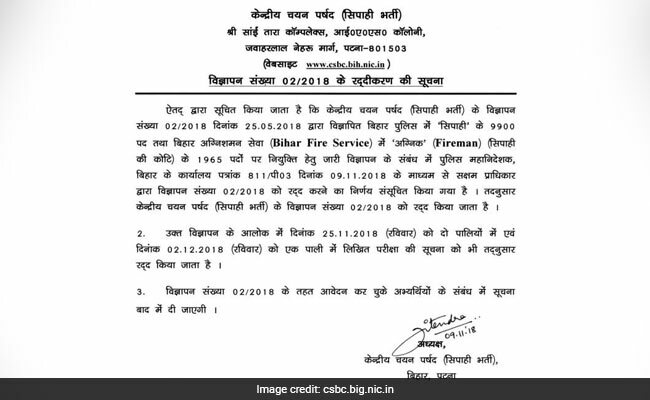 CSBC, Bihar had earlier notified advertisement 01/2018 for selection of Driver Constables in Bihar Police and Fireman Driver in Bihar Fire Services. The total vacancies advertised in this recruitment was 1,669. The recruitment process for advertisement 01/2018 is in it's last few stages with the PET conducted in October.